The April 14 strikes against Syria’s chemical weapons arsenal were successful in degrading the country’s chemical weapons, research and storage facilities, the Pentagon’s chief spokesperson said. U.S., British and French service members launched attacks that severely degraded the Syrian chemical arsenal and sent a message to Syrian leader Bashir Assad to stop using chemical weapons against his people. U.S., British and French forces launched attacks against the Syrian government’s chemical weapon arsenal in retaliation for the use of such weapons on civilians, Defense Secretary James N. Mattis and Marine Corps Gen. Joe Dunford, chairman of the Joint Chiefs of Staff, said. Chief Pentagon spokesperson Dana W. White and Joint Staff Director Marine Corps Lt. Gen. Kenneth F. McKenzie Jr. brief reporters at the Pentagon, April 19, 2018. KC-135 Stratotankers and F-15C Fighting Falcons assigned to U.S. Air Forces in Europe take off from a base in Europe, April 11, 2018. Assigned aircraft conducted refueling support and defensive counter air operations during the strikes in Syria. F-15C Fighting Falcons assigned to U.S. Air Forces in Europe take off from a base in Europe, April 11, 2018. Assigned aircraft conducted defensive counter air operations during U.S. military strikes in Syria. Chief Pentagon spokesperson Dana W. White and Marine Corps Lt. Gen. Kenneth F. McKenzie Jr., Joint Staff director, brief reporters on U.S. and allied strikes targeting the Syrian regime’s chemical weapons infrastructure, April 14, 2018. U.S. 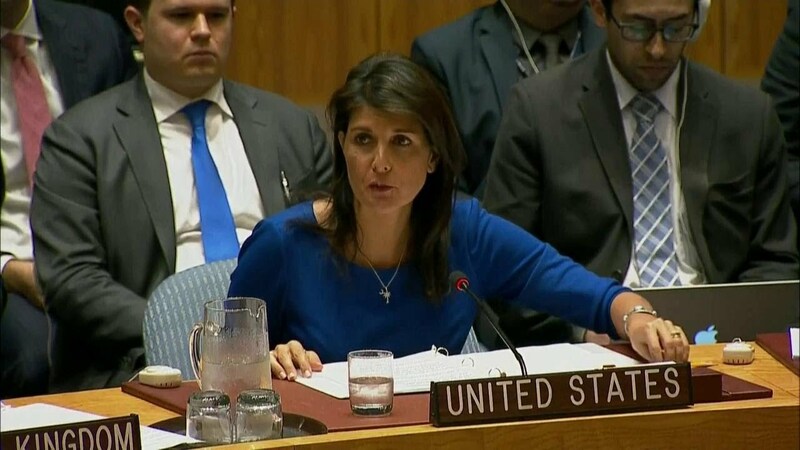 Ambassador to the United Nations Nikki Haley gives a statement during a meeting of the U.N. Security Council in New York, April 14, 2018. A transcript will be available at https://usun.state.gov. President Donald J. Trump announces he ordered the U.S. military to launch precision strikes on targets in Syria associated with the chemical weapons capabilities of Syrian dictator Bashar Assad, April 13, 2018. Defense Secretary James N. Mattis and Marine Corps Gen. Joe Dunford, chairman of the Joint Chiefs of Staff, brief reporters at the Pentagon about military operations in Syria, April 13, 2018.